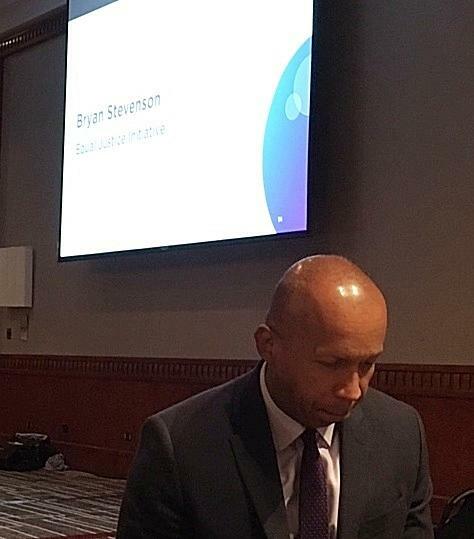 Bryan Stevenson, founder of the Equal Justice Initiative, won a U.S. Supreme Court case banning mandatory life sentencing without parole for anyone age 17 or younger. Based in Birmingham, Alabama, a state that officially celebrates Robert E. Lee and Martin Luther King, Jr., day together, the Harvard-trained lawyer has dedicated his life to serving the poor, the incarcerated, and children prosecuted as adults. Stevenson keynoted the final day of the 2016 Conference on Adverse Childhood Experiences held October 19-21 in San Francisco and hosted by the Center for Youth Wellness (CYW). CYW is based in Bayview/Hunter’s Point, a part of San Francisco as far removed from the thriving high-tech scene as is Birmingham. The founder of the Center for Youth Wellness, Dr. Nadine Burke-Harris, a dynamic pediatrician and social activist, introduced Stevenson, whom she met at a dinner hosted by Alphabet (formerly known as Google) chairman, Eric Schmidt. Fortuitously seated together, they both recognized in each other a drive to create more justice in this country. “America is the most punitive nation in the world,” Stevenson began, and then cited some well known statistics: the U.S. incarcerates 2.3 million people today, up from 300,000 in 1972. Stevenson said blacks suffer most, because one out of three male African American babies are now expected to go to prison. He offered several solutions, some cultural, some policy-driven, such as having the U.S. Centers for Disease Control and Prevention declare a health crisis in the 200 zip codes in the U.S. where 80 percent of the children are expected to end up in jail because of the dire circumstances they will experience, including family violence, neighborhood violence and systems violence. To me, the child of a holocaust survivor, whose own parents and grandparents were survivors of anti-Semitic pogroms in Eastern Europe, Stevenson’s depiction of America as a “post-genocidal society,” created by “an ideology of white supremacy” rang true. In school, we are taught that this country is shaped by the desire for equality, yet as Stevenson points out, “The demography of this nation was shaped by racial terror. “Slavery didn’t end in 1865. It just evolved,” he added. He cited examples of countries that have faced up to their genocidal history, including South Africa with its Truth and Reconciliation Commission after apartheid, and Germany, where in Berlin plaques are mounted on buildings denoting former homes and businesses of Jews who were killed or forced to leave. In his own attempt to reconcile with our past and promote healing, his institute is putting up markers at every lynching site in the U.S. Stevenson has also written a best-selling book about his work and life, Just Mercy. Bryan Stevenson: To heal our national trauma, we need to face our genocidal past was originally published @ ACEs Too High and has been syndicated with permission.